I had been wanting to upgrade my coldbag, because even it works really nice, the little seedlings could have even more advantages. In particular I wanted something that would let more sun to the little seedlings. So I started scavenging for materials to use. I didn't wanted to build one out of wood and glass, because my goal was keeping the portability and cheapness of the cold bag. I considered using a cardboard box, but I knew that on the first rain, or with the water pouring out from the little started planter, I would end up with a cold frame soup in no time. Then I remembered that here, at some grocery stores, they always leave all the plastic boxes from the food, all cleaned and ready for people who need them to pick them up. So, one day I went grocery shopping, I took a small look at their little recycle corner. There I found the perfect box. It was a deep, thick expanded polystyrene box, in perfect condition. The build was very simple. Cut apart a transparent plastic bag to have two sheets to use as "glass". I taped one of the transparent sheets to the edge I had left and cover the hole in the frame. Turn around the lid and tape the other sheet from the inside. This will make the window a sandwich of plastic, air and plastic. I used two plastic sheets, one in each side of the cover. That way the insulation will be much better. The air in the middle will work as the insulator. The same way a double glass (double frame) windows work better than a single glass window. So far it has worked beautifully. The little seedlings growing there sprouted in no time, they have even reached the size of the ones in the coldbag already. The first to grow were the Bekana and the Komatsuna, then the spinach and finally the lettuce, coriander and the chives. I was surprised the chives and the lettuce sprouted, they are supposed the be past their season. They must really be very cozy and warm in there. I hope they all keep growing nicely, I will post more about how they develop later. Now, the only setback is that the new coldframe has such a good insulation that every morning the inside screen appears all damped because of the condensation. I have to dry it a bit and clean it up so it will let the sunshine in. I recommend anybody who wants to have a nice cheap planter at their homes to use old expanded polystyrene boxes. First, because is much better to reuse them than throw them to the garbage. Second because they are great planters. Expanded polystyrene is a great ecofriendly material, even though it certainly doesn’t look like it. It is a great insulator, and has an amazing endurance for such a light weight. It definitely won't mold and It will not degrade easily, so I can last lots of gardening seasons. One more thing about polystyrene. It is highly recyclable, but it very hard to do it because it has to be sorted away from other materials, which is a very troublesome task. This causes a big problem because it is usually thrown with normal garbage and pollute instead of being recycled. So, if you can rescue some polystyrene from going to the dumpster, and give it some more years of use please do. 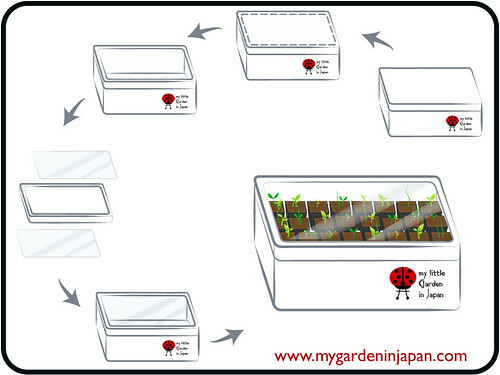 Excellent information and the graphic you made demonstrating how to create the seedling coldframe is nicely done! I try not to buy new polystyrene because as you said, it rarely gets recycled and I don't want to encourage manufacturers to make it. I do applaud efforts to keep existing polystyrene out of the landfill, though. Your project is a wonderful alternative to that problem. It is easy for me, to found polystyrene, I took them from a man who sell fish. 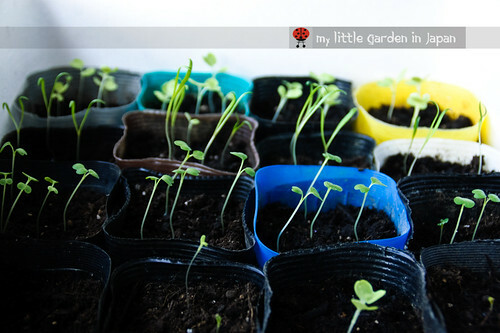 And I use yoghurt pots for my seedlings. Fer; even if you hadn't told us, we would have guessed that you are a student of Engineering! I share your views on expanded polystyrene. It's great for many purposes, but getting rid of it when you don't want it is really difficult. Couldn't you do a study on how to de-expand it or something?? Fer...nice post and great info! Your seedlings must be the cosiest and best looked after in Japan. What a great idea! 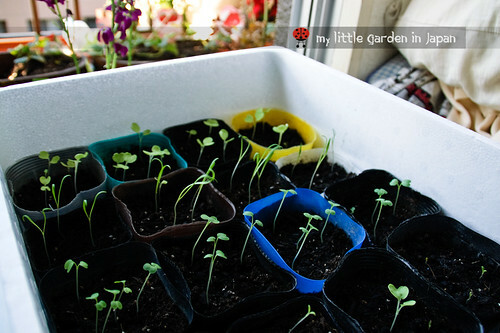 Love how inventive you are in keeping your seedlings cozy. What a wonderful set up you have made. I am sure that your seedlings will do wonderfully. I look forward to seeing what else you are up to. Great idea Fer and good use of a particularly difficult product to get rid of. I'd try turning your cold-frame every few days or so too so that the seedlings don't lean one way and grow nice and straight. Well done - recycling plus warmth and light for your seedlings - all in one handy package! A very clever idea. Good idea and very excellent description with graphic! Sure your seedling will grow wonderfully! Nice improvement! I'll again chime in and say that the clear plastic zippy bags that bed comforters and large blankets come in are also great for this. You could even sit the tray inside and just zip ot around the plants. I like using the styrofoam, since it probably keeps things even warmer. Love it! Great ingenuity on your part to improve on the first version! 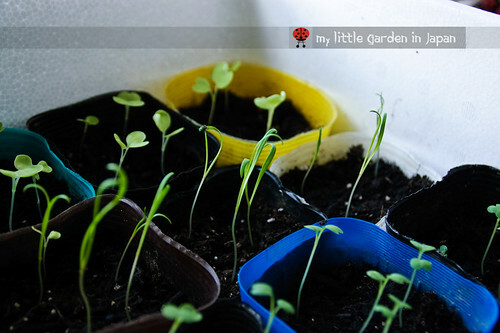 Your seedlings will be cuddled in warmth and cosiness while they grow. fer that is an amazing process you have put together ! and how quickly those seedlings have sprouted ? wow ! .. will you have enough room now for them to grow full sized ? Do you have an allotment of some kind with the apartment building? .. what a great use for the material that is so difficult to recycle ! Well done !! Really good info and I like your drawing. Fer,very inventive, next year is my turning point, I am going to be less wasteful. I do use polystyrene as drainage crocks in planters. Can't say I've ever thought of expanded polystyrene as eco-friendly and it bothers me rather that so much is used. I was concerned that you might have problems with damping off and etiolation in your frame but you seem to have overcome problems with condensation. All this is very exciting. Designing and making one's own equipment can be extra-satisfying. Thank you! I hope they grow nicely. I will set them up in the big vegetable planter and the hanging one. They are empty now, just waiting for the seedlings to grow enough. Oh, and they grow sideways so fast, even if I turn around the box several times a day, they get sideways in hours, I cant get them to grow straight up, I guess is because we have a very slanted sun this time of the year. And so glad You liked my drawing, I am not much of an artist, but I am giving the first steps into Ilustrator. I have plans for a lot of other graphics for gardening. Very informative fer. I am forever collecting polystyrene boxes. Keep many spares one. You are very talented in drawing. Happy New year! 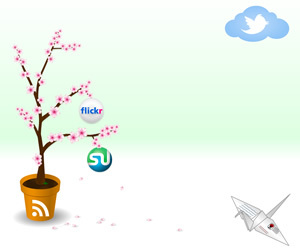 and the best gardening for 2011!